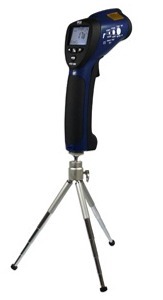 The PCE-890 infrared thermometer is ergonomic and easy to carry. 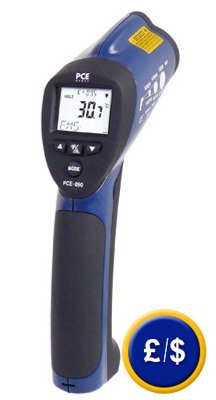 This infrared thermometer is designed for professionals and has a range up to 1600°C. It measures surface temperature without contact. The device has a ratio between distance and measurement point of 50:1 allowing the measurement of small objects at large distances, with a measurement point of 40 mm at a distance of 2 m. The infrared thermometer can be used in poor lightning conditions. The backlit display is clear and easy to read. The emissivity level can be adjusted between 0.10 and 1.00. High and low alarm levels can be set for measuring within specific temperature limits. An ISO calibration certificate can be ordered separately for this infrared thermometer. Here you will find more information about different infrared thermometers to measure temperature. For companies that wish to incorporate this infrared thermometer as one of their internal testing tools or for performing an annual recalibration. This includes a laboratory calibration, a control document with the calibration data and an ISO certificate, which will contain company details.